Now as you’ll notice by the excellent markings I’ve made to the image itself, Bing has moved the Facebook Like button to within the photo. This is probably in hopes to draw more attention to it, and maybe help people get the point that they are actually "Liking" the Bing Image, and not Bing.com itself… don’t worry, we like you Bing! I really think this move will help them get a lot more likes. Time will tell. 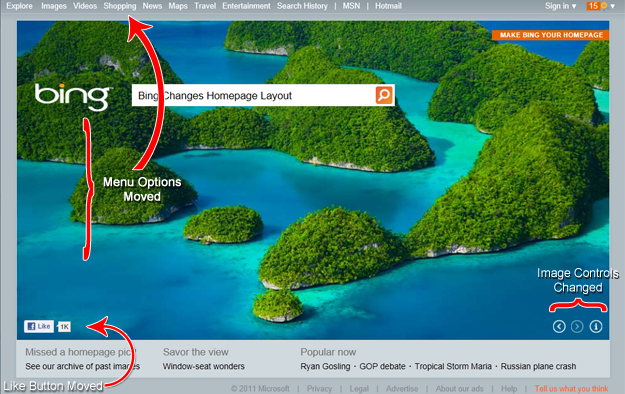 They have also moved the menu options on the left of the image, and stuck them up there on the explorer bar. That’s right, up there by your wonderful Bing Rewards button. Man, I sure hope I win some free stuff in the sweepstakes I entered! Last but not least, in fact, this is probably the best change, the control buttons for the image have changed. The buttons are no longer boxy, outdated, and hard to see. They are well rounded, and easily noticeable. Most importantly, they changed the copyright © symbol, to a nice "information" symbol. This new information button, believe it or not, has the exact same function as the © button did. You hover over it with your mouse, and it gives you a description of the image. I’m guessing that people didn’t know this functionality existed (I figured it out just a month ago), so they made it a little more user friendly. Good job Bing! Bing's Old Buttons on left, New Buttons on right.